15/6/09 – Heritage – Calais, Church of Notre-Dame – A little over five years ago, we had written an article, in French, on the church of Notre-Dame in Calais, whose choir and Baroque altarpiece, badly damaged by the bombings of WWII, had awaited sixty years for a restoration. The article contains many photographs showing the quality of the monument and the scandalous condition it had been left in. 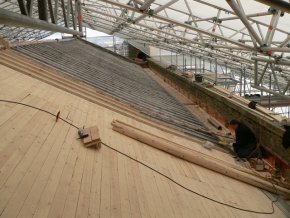 After numerous delays, the restoration project, which was supposed to start in 2008 (see news item of 18/12/06 in French), finally got underway last 7 January, with the first stage repairing the roof of the choir. 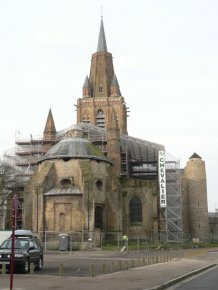 There is no doubt that once restored, this church (the only old one left in Calais) and its altarpiece will become a major tourist attraction for the city, along with its new Musée de la dentelle inaugurated on 11 June by the Minister of Culture.